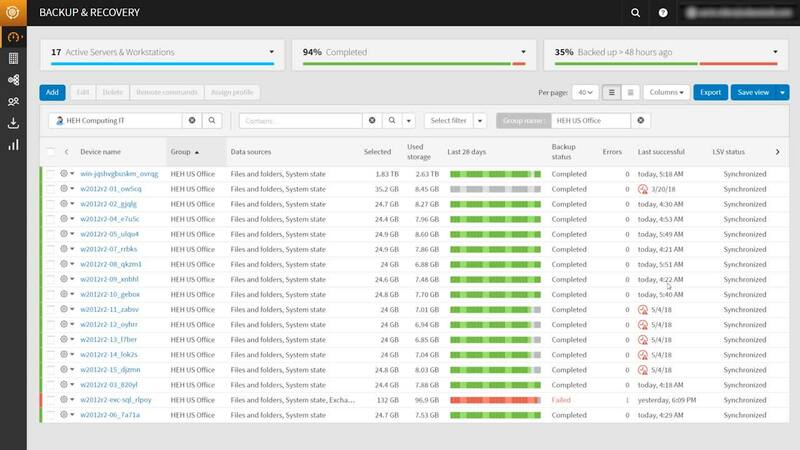 SolarWinds Backup is a cloud-first SaaS backup service for your virtual and physical servers. In this video, learn how to get started and take your first backup. To start protecting your valuable systems with SolarWinds Backup, launch your browser and navigate to backup.management. Enter your credentials to access the web-based backup management console. First, let's review group management and backup profiles. Group management lets you define the physical, logical, or geographical grouping of the devices to be protected. For example, groups can consist of remote offices, departments, or even types of servers. From the Group Management panel, you can Add, Remove, Edit, or Search for Groups. Backup profiles allow you to save time and simplify configuration and management. You can pre-define selections, schedules, and settings. These can be applied to devices during initial deployment, or later to multiple devices, with just a few clicks. The Data Sources tab lets you specify if backup selections are defined by the profile, excluded from backup, or configured locally on the Backup Manager client. The default selection, Backup, will include all attached local volumes. This can be changed to include only specific volumes or paths, such as the C drive. Filters and exclusions can also be defined to limit what data is protected. For example, you could choose to exclude the data directory on the F drive or all MP3 files. With the Schedule tab, you can easily set up multiple recurring backups. The LocalSpeedVault tab lets you specify a secondary local backup repository in addition to the remote copy. Automatic Deployment allows you to add dozens of devices quickly and efficiently. Start with any of the dashboard views, and click Add to launch the Add Device dialog. Click on 'Automatic Deployment' and select your Backup Profile. You can also add a new profile if you like. Once you click Next, you will be presented with a download link to the Backup Manager client, and a location-specific installation string that can be run several different ways. For example, it can be run from an elevated command prompt, via a third-party software deployment tool, embedded in a PowerShell script, or tied to an Active Directory group policy for deploying one or more devices. Automatic deployment uses system-generated encryption keys, so you don’t have to manage them separately. Your first backup is typically the largest, and the longest to complete. Once you have finished this initial backup, your ongoing delta backups should be significantly smaller (around 1% or less of your selected size, on average) and should take much less time to complete. For most systems, making your selections, starting a backup, and letting it run to completion is the best way to get that initial backup offsite. Now that the initial deployment and backups are completed, you are ready to use the SolarWinds Backup console to monitor backups, manage by exception, and create custom reports. Click this link to go to the next video.